Your training package includes 10 booklets, 10 glancers, plus a downloadable leader’s guide, quiz, and certificates of participation. This essential training kit covers all of the basic skills needed to work with customers over the phone. From making a positive first impression to avoiding common pitfalls of poor phone service to wrapping up the call with a good closing. Give your team the essential phone skills they need with this five part training tool. Your package includes 10 copies of the Training Booklet, one copy of the Leader’s Guide, 10 Glancers, and downloadable Quizzes and Certificates. The Training Booklets and Glancers may be used on their own as a handout or you may conduct more formal training sessions with the Leader’s Guide, Quizzes, and Certificates. The Handbook of Essential Phone Skills covers all of the core techniques that frontline reps need to ensure every customer conversation is positive and professional. In its pages your staff will find information on the importance of voice quality and how it can be improved through correct diction, pacing, tone, and breathing. They’ll discover the important voice-body connection and learn how smiling, good posture, and even gesturing can enhance voice quality. And they’ll learn how to make a positive impression through their greeting, use of the caller’s name, active listening, and a professional closing. They’ll even learn to avoid the common mistakes made when answering the phone, putting a caller on hold, transferring, and leaving voicemail messages. 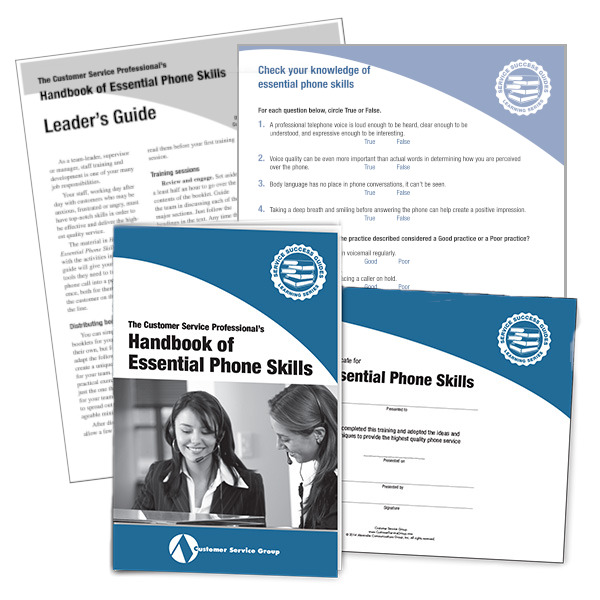 This booklet is packed with these and other essential phone skills, which will help anyone who uses the phone present a more professional image. You may not realize it, but body language has a huge impact on your voice quality and the impression you make over the phone. Use these body language basics to enhance your phone presence. Smile. No, callers can’t see it, but they can hear it. Place a mirror on your desk to remind yourself to smile. It may sound strange, but talking to your image and seeing yourself smile really does come across in your voice. Practice good posture. Don’t slouch, rest your head on your hand, cross your arms, or fall into any other bad posture habits. Instead, sit up straight and act as though the caller is standing right in front of you. It will come through in the quality of your voice. It will also allow you to breathe more easily. Vocalize visual cues. In a face-to-face conversation, you might nod or use eye contact to show that you are listening and understand. But the caller can’t see these cues, so use phrases like “yes” or “I see” to show your attention and understanding. On the other hand, feel free to gesture. While the caller can’t see your motions and body language, your actions will add energy and a little zip to your voice. But does it really work? This exercise will convince your staff that yes, it does. “Good morning. This is Jane Johnson in the ACME customer service department. My number is 555-123-4567. “I am calling about the new pricing schedule for our widgets. You’ll now save 20 percent when you purchase in quantities of 25. To take advantage of this special offer, please call me tomorrow after 10 am. “Again, my name is Jane Johnson and my number is 555-123-4567. Ask each team to stand back to back. Have the person holding the script read it aloud. Now ask the teams to turn and face each other. This time the reader should speak directly to her partner, she should smile, and gesture freely. Invite all of the participants to discuss the changes that they saw and heard when body language was added to the message. Your package includes 10 Glancers. Just peel and stick to computer monitors or dividers for a handy reminder of the important lessons learned in the guide. Reps will “glance” up to be sure they have covered all of the important elements of the call and to refresh their memory with key words and phrases. Handbook of Essential Phone Skills is guaranteed. We want you and your reps to use this valuable resource and put its ideas to work in your department. Then, if you are not 100% satisfied, you may return your materials within 30 days for a full refund.